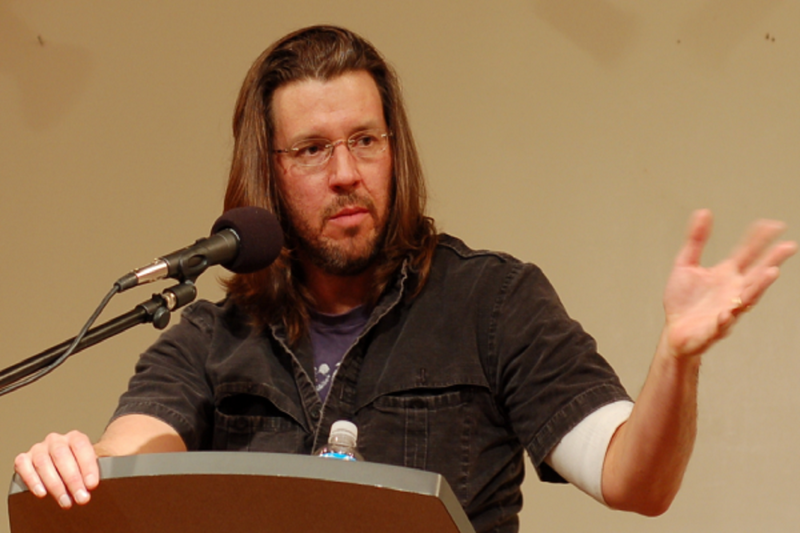 As we mark 10 years since David Foster Wallace’s untimely death, Getintothis’ Chris Leathley explores Wallace’s magnum opus Infinite Jest and explains why it remains such a vital literary work. There is something perverse regarding our endless fascination with works of literature that carry the label ‘difficult’. More often than not, such challenging tomes are seen as crucibles through which every discerning reader must pass. Should you fail to do so, you are unworthy of the work (and maybe even literature in general?). In fact, the more obtuse, the more cryptic and bamboozling a novel might be, the more likely we are to worship at the altar of its fecund erudition. Or something that equates to that tediously pretentious terminology anyway. One even suspects that more than a few critics, intimidated by the sheer dizzying complexity of a book, may well consider the sprawling mass of text; sigh wistfully; and then write 1,000 words of blind hero worship rather than spend hours, days or weeks attempting vainly to critically engage with it. After all, something so undeniably clever has got to be good. Right? With these words in mind, you may be wondering what point there is in seeking out David Foster Wallace’s enigmatic masterwork Infinite Jest. The 1996 novel is a 1079-page behemoth that has often been dismissed as hipster pseudo-intellectualism, crammed full of frenetic knowledge but ethically rudderless. A book that chooses a deliberately skewed chronology and confuses the reader with its non-linear narrative. A novel that infamously contains nearly 100 pages of footnotes. In an age where our leisure time would increasingly appear to be reducing in scope (at a rate parallel to our diminishing attention spans), it is not unreasonable to ask who has the time and energy for this type of literature? This is especially true in an era where, although overall book sales are healthy, sales for fiction and poetry are declining. Yet, make no mistake. This is an extraordinary book that casts an astute and baleful eye upon American society. It does so with humour, with intelligence and with profound ambition for what the novel, as an art form, can still do. To attempt a comprehensive synopsis of Infinite Jest would be futile in the extreme. More importantly, it would spoil the reading experience for you. Briefly though, it depicts a dystopian near-future America (perhaps we are already there?) dominated by addiction to drugs, media and nostalgia. Within this world, lurks ‘The Entertainment’, an ultimate audio-visual experience that (so rumour has it…) causes the viewer to expire in a state of comatose ecstasy. This proves to be a focal point for multiple narrative strands throughout the novel. Characters inhabit varying locales, ranging from privileged prep schools to drug rehabilitation centres. Tales of deadly (and funny) espionage are interwoven with intimate considerations of grief, identity and life on the margins. All of this is done while Wallace composes a cultural and societal commentary of exquisite pitch and poise that is peerless in its insight. He embraces the sacred and the profane with similar energy. What’s more, he tells us important things about both. 1.Cultural Comment for our Times – For a book that was written over two decades ago, it is remarkable how relevant it remains. Infinite Jest reads, at times, like a necessary and wickedly funny polemic. It savages the modern fixation upon untrammelled consumption and exposes the inevitable partner to supply and demand, that is, addiction. Wallace is ingenious in his use of satirical hysteria to prick the many cultural and societal bubbles that dominate America. From hilarious takes on media branding to ribald dissections of broadcast television, disturbing meditations from inside professional sport or unravelling the epidemic of drug-fuelled escapism that still plagues the nation, Wallace takes aim and let’s rip. In the age of Trumpism, Infinite Jest rings true every time. 2.True Reality – Infinite Jest plays around with temporal themes. This is important, not least because time and our perceptions of time are essential to our lived-in experience, our life as we know it, our reality. Memories and emotions do not come to us in neat packages of logical order and definition. Thoughts and feelings come unbidden. They are often of uncertain provenance and we are, perhaps more than we admit, unable to discern between reality and fantasy, especially when reflecting on our past. This makes Infinite Jest a book that reflects our reality in a much more accurate manner than we might at first acknowledge. For all those who criticised its complex rejection of linear storytelling or its detachment from the ‘real world’, one wonders whether those critics recognise the artificiality of their own pre-conceptions of the world. David Foster Wallace certainly does recognise this and his book is replete with references to these false pretences. 3. Games within Games – Infinite Jest, far from being a morose or overly serious text is in fact, an inherently playful book that urges you, the reader, to play that game. As such, it is a book that demands and fulfils a reader’s desire for stimulus. It does so in a fun and inventive way though and is certainly not ‘difficult’ for the sake of being ‘difficult’. The puzzles that pepper the book, be they chronological, linguistic, contextual or whatever, are designed for enjoyment. What they do not amount to, is a masturbatory statement of intellectual superiority by the author. 4.Humour and Imagination – Infinite Jest has moments of bleak awareness and brutal despondency but it is dominated by a sly, sardonic wit first and foremost. Wallace, when faced with the undeniable horror of modern America chooses to laugh rather than cry. There are vignettes within vignettes, comic plays on language and numerous sideswipes at our political leaders that leave you heaving with laughter. Even at its darkest, Wallace mines America’s tragedy for moments of mirth that leave the reader breathless. Equally, the book fizzes with creative brio. Both in terms of structure, dialect, syntax, font and layout, Wallace attempts something fresh and original. Most crucially, Wallace took risks when writing this book and risk-taking is a common trait amongst our greatest artists, musicians and filmmakers. 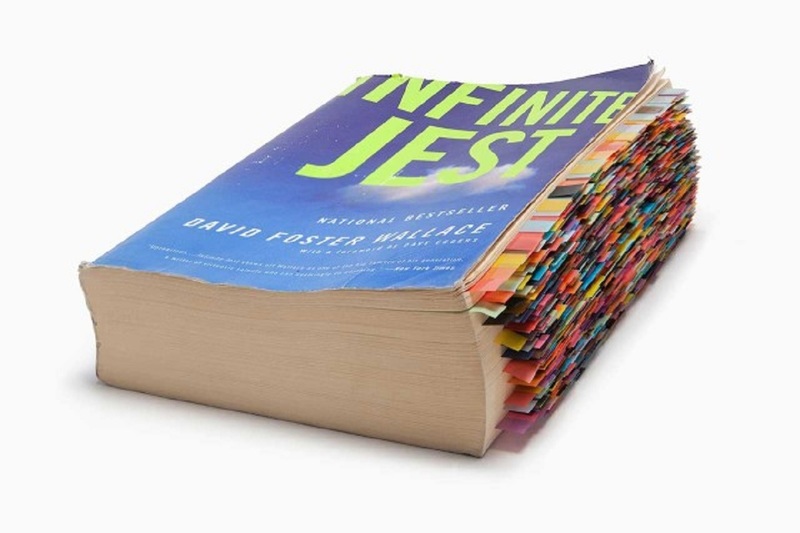 It adds further heft to the argument that Infinite Jest is a book which should be read. 5. Questioning Fulfilment – Normally, when you complete an action, read something or view a work of art, you are seeking resolution and, with that resolution, a sense of satisfaction. For the most part, our times have dictated that such fulfilment can only come from tidy conclusions and neat finales. David Foster Wallace makes no attempt to patronise us with this grotesque fallacy. Instead, he respects the reader enough to offer he or she the same mass of ambiguity and uncertainty that colours all our lives. Wallace relishes emotional sincerity over crass determinism. If stories told in Infinite Jest have no easily defined finish, then Wallace states that this is true and this is good. There is, ultimately, something much more satisfying about this than any ‘Hollywood’ ending. We are under no illusions. We know that much of what this ‘review’ suggests will make Infinite Jest sound like harder work than it really is. Perhaps this will put some of you off which, whilst sad, is not entirely without merit. Infinite Jest is for you. Previous ArticleAnna von Hausswolff, The Dome, London.